Successful projects rely on the skills and experience of engineers second to the design team to identify key issues applicable to a project at the modelling stage and for them to be successfully managed through the contract works. The success of many challenging projects undertaken by earthworks contractors is a testament to the capabilities of individuals within the practice. Most, bulk earthworks, in Karratha, in the Pilbara region, Western Australia, are carried out by, local earthworks contractors. These companies have a modern fleet of the right earthmoving equipment for the right job. 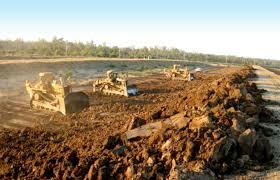 Expert civil & structural engineering contractors in the Pilbara region, are capable of executing large bulk earthworks. They are equipped with the right personnel and equipment to do the job right. These contractors specialise in project managing and constructing civil infrastructure including dams, roads, pipelines, bridges and bulk earthworks in addition to mine- site infrastructure and contract mining operations. They have the ability to efficiently mobilise and commence operations in some of the country's most logistically complex locations. They offer local knowledge and experience and have completed broad-ranging projects for an extensive list of energy and resource sector clients. They have considerable expertise in gas infrastructure and offer the agility to deliver services at many stages - from initial bulk earthworks through to production and transportation. They are experienced in the delivery of access roads, drill pads, well infrastructure, pipelines and pump stations, water treatment plants and concrete work. Have a dedicated team of earth moving contractors who have the expertise and diligence to quickly and efficiently respond to your needs, using the very latest earthmoving equipment. Continually train and educate staff in order to create a standard of excellence and provide a safe performance driven work environment where staff can grow and achieve their personal goals. Have a modern fleet of the right earthmoving equipment for the right job.